Apricots from a bitter Plum tree. 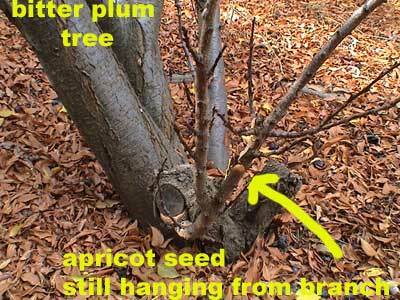 About 1983 I put a pile of apricot seeds in the garden and the following year I had lots of small trees. I started giving them away the following year. One of the baby trees I gave away was very hardy. Even though the new owner kept mowing it down, it kept growing up again. In the end she decided it would have to stay and eventually it produced good crops of apricots. God let me know that we would be shifting from our house so I said to Him that it would be nice if the people in the place He was sending us to would plant an apricot tree, so that by the time we moved in, there would be fruit for us. Years passed and we ended up shifting to Australia. We had lost most of our material assets and so I withdrew the only money I had left, my life insurance, to use as a deposit on a small house that suited our small budget. We had said we wanted our next house to have a view. We found one that did. It had two pleasant views. The kitchen was a good size and looked out onto a garden area. The lounge was small but looked out over the city. At the time I was delighted with all the plants in the garden. 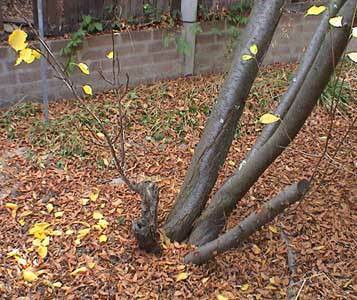 It even had a Magnolia tree and I had planted them in each of the two places we had owned. Some time after moving into the house I began to think we had made a mistake in buying this house. The Magnolia tree had died in the heat the previous Summer. The house was too small and the ceilings had started peeling. I had never seen peeling ceilings before and although I created an art work called "Silver Lining" from photos of the peelings and loved the look of them, I was disgruntled. I remembered my prayer from years earlier and thought, "It doesn't even have an apricot tree." I went for a walk and thought that I would prefer a house that looked the other way so I could watch the spectacular sunsets. God reminded me immediately of our first morning in our present house. One of the children had called us to come and look at the spectacular sunrise overlooking the Black Mountain tower. I had praised God then that even though it didn't have sunsets, it had sunrises. The view had reminded me of a city watchtower where a prophet could look out and remember to pray for the city ... I hadn't spent much time doing that. The following evening I walked into a corner of the garden I didn't go to much and looked at one of the bitter plum tees we had. I noticed some fruit growing on some of the new branches that I had let grow out from the heavily pruned stumps of what I thought was the original stock or grafted branches. I was so surprized when I saw Apricots! Apricots from a bitter plum tree! I laughed and praised God. I was able to eat a few apricots from our tree. I counted the rings on the cut branch and it looked as though it was about 18 years old, so it could easily have been grafted on, around the time I had prayed. What an amazing thing. Amazing too that I had seen the apricots. I praised God and decided to work on being content with the house we had. "Now keep asking him for things that you need. If you do that, you will receive them, and then you will be completely joyful." (John 16:24 http://ebible.org/t4t/JHN16.htm).